3 Bedroom Semi Detached House For Sale in Wincanton for Asking Price £200,000. A delightful three bedroom semi detached home, presented in immaculate condition throughout and benefitting from a contemporary layout that includes a spacious Living/Dining room which leads to a modern kitchen and a sunny aspect rear garden. To the first floor, there are three good size bedrooms and a new bathroom suite. The property sits upon a popular road in Wincanton and also offers gas fired central heating, double glazing and off road parking. With steps leading to porch area and raised seating are accessed via living room doors. 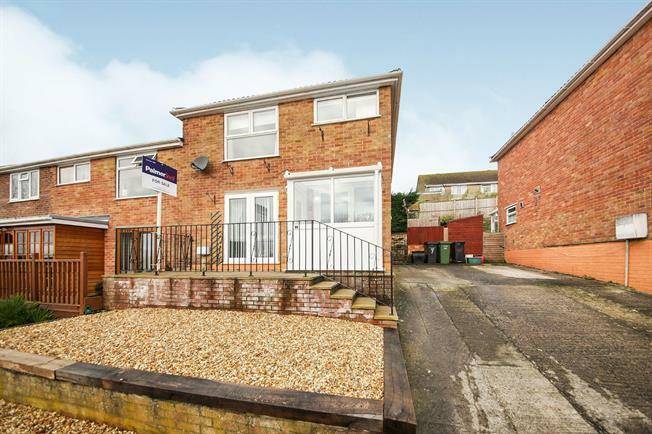 Side access to rear garden and driveway providing ample parking. A stylishly presented modern Kitchen offering a range of base and wall mounted units with roll edged work surfaces over. Integrated high level Fridge/Freezer, 'NEFF' cooker and inset four burner hob. Space for washing machine and dishwasher, with double glazed window to rear. Double room with loft hatch access, double glazed window to rear and radiator. High level over stairs storage cupboard, radiator and double glazed window to front. A contemporary suite comprising walk in corner shower, white ceramic wash hand basin, low level WC, and panelled bath. Chrome heated towel rail and obscured double glazed window to rear. Sunny aspect rear garden with an initial sheltered patio area, which leads onto a raised section laid to lawn with a water feature to the corner. Enclosed by timber fencing and walled to back.